I've been really inspired by 'shelfies' on Instagram lately (example here and here) and I thought it'd be fun to show you some of my products. 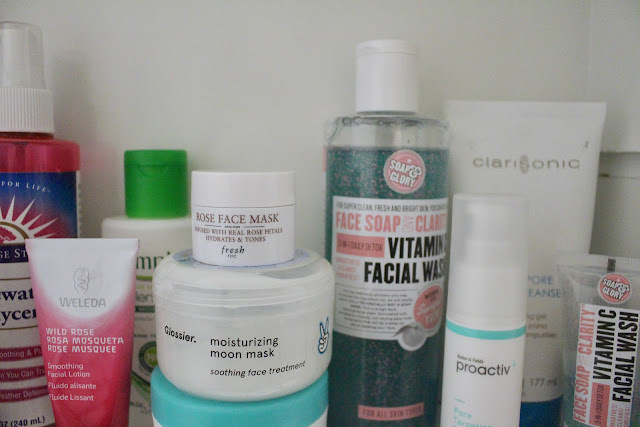 I typically only include things I'm really loving at the moment when I do Friday Faves, so you don't always see all the other products I hoard. Wegmans Coconut Oil - A little bit of Upstate NY in my cabinet. I use it as a hair mask or to remove my makeup (not always, since I make a mess doing so). Organix Moroccan Argan Oil - Love putting this on the ends of my hair after I shower, also smells like it's a high end product (does that make sense?). Living Proof Prime Style Extender - Seriously works.. I use this on damp hair and however I end up styling it, it lasts for days. 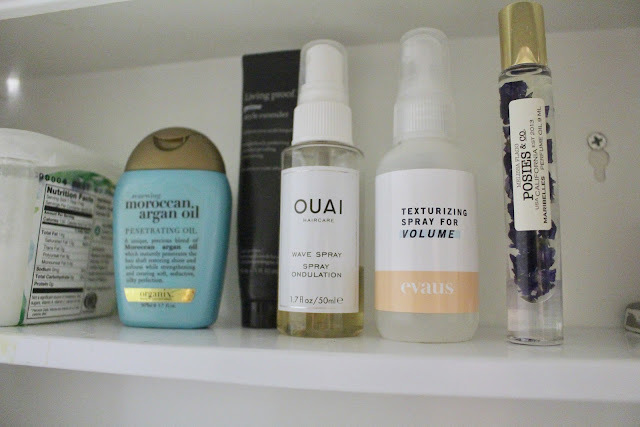 Ouai Wave Spray - I use this when I curl my hair & want more texture. Posies & Co. Hair and Body Oil - I'm forcing myself to get in the habit of putting this in my hair/on my pulse points, even if I never do, it's a gorgeous bottle. Goldfaden MD Fresh A Peel - Brightens and resurfaces your skin, I use this 1-2 times a week depending on what my skin looks like. Aussie Dry Shampoo - does the job, not obsessed, but I like it because it doesn't have a lot of white residue. Heritage Store Rosewater + Glycerin Spray - I cannot live without this (I've gone through 4 bottles since summer...). 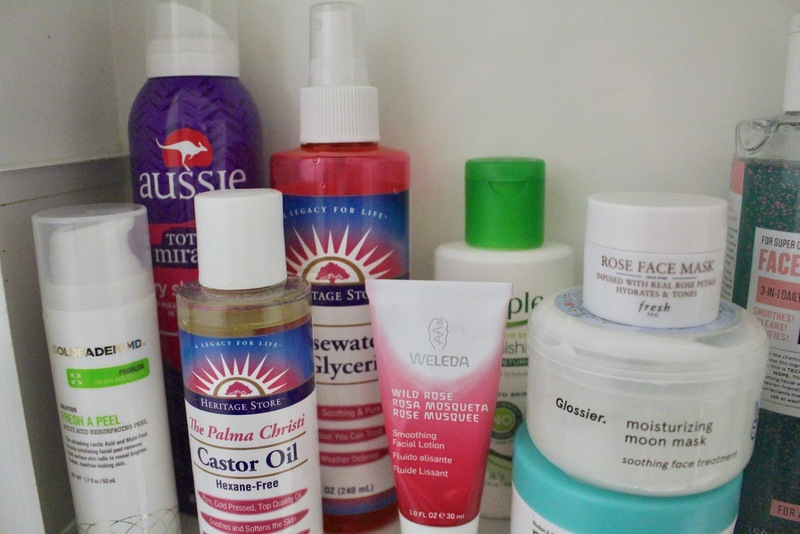 I use it fresh out of the shower, before I do a mask, mix it with my foundation, and to set my makeup. Heritage Store Castor Oil - I put this on my eyelashes and eyebrows. People have been asking me if I have eyelash extentions, nope. Just this. 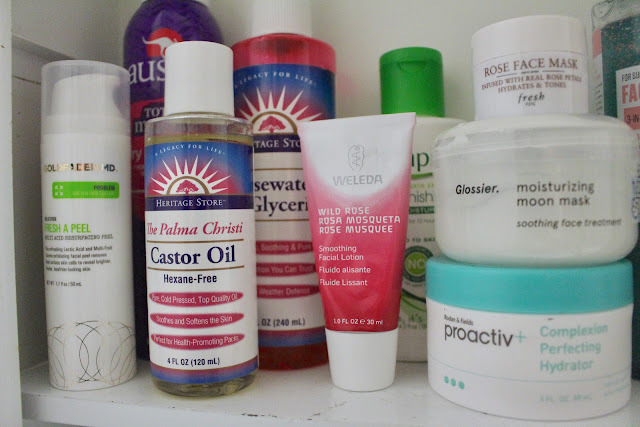 Weleda Wild Rose Smoothing Lotion - I use this when my skin isn't super dry. Has a terrible smell, but it's really lightweight so I like it. 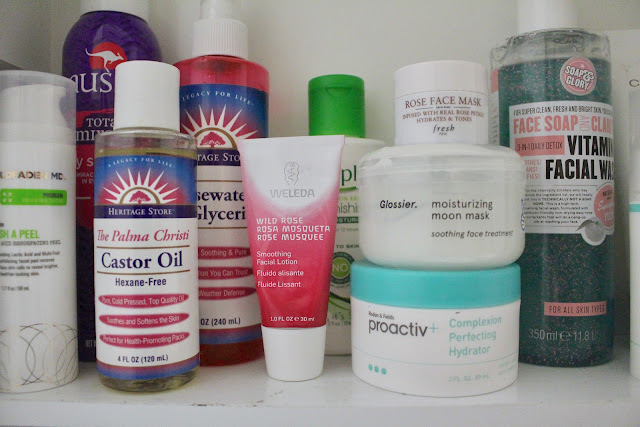 Simple Replenishing Moisturizer - I used to love this, but I think my skin got too dry/sensitive for it because it started to burn when I applied it (lol?). I'm keeping it for when I'm not as dry from winter. Fresh Rose Face Mask - I love this little dude. Really needs to sit on your skin for 20+ minutes to see a difference. 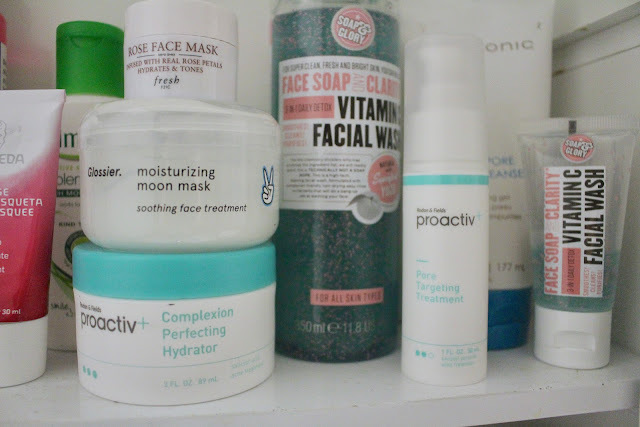 Proactiv Complexion Perfecting Hydrator - I adore this. 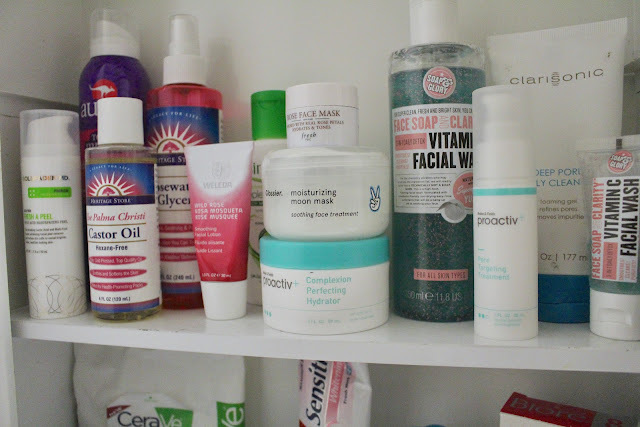 Gel consistency, and has a bit of acne fighting ingredients. 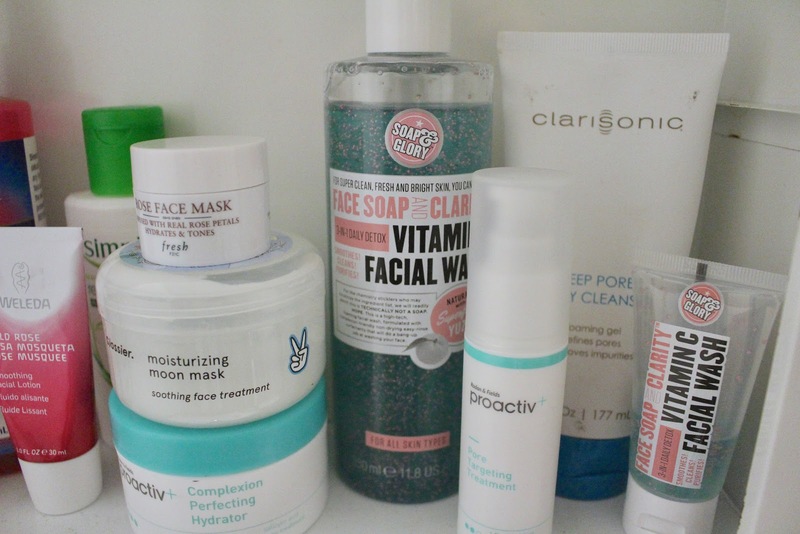 This is what I've been using for my really dry skin! Soap & Glory Vitamin C Face Wash - I just started using this but it's soooo good. It smells citrusy and bright, has some beads in it that don't scratch up your skin, and it's technically not a soap so it doesn't dry out your skin. Clarisonic Deep Pore Cleanser - This came with my Clarisonic, don't love it, don't hate it. Foams up really nicely and gets all my makeup off. Proactiv Pore Targeting Treatment - For pesky blemishes, I usually put this on at night and they're gone by morning. CeraVe Makeup Removing Wipes - I actually really don't like these (If I being honest). Someone had extra and gave me this so I'm just using it up. (I prefer Pond's) They burn my eyes and don't have a ton of remover on the wipes, making them dry and scratchy. Colgate Sensitive Whitening Toothpaste - Self explanatory. Garnier Micellar Water - I'm almost out of this and I'm distraught. I use it to remove mascara and instead of washing my face in the mornings (since my skin has been so dry I don't like to wash it twice a day) I usually just drench a cotton pad with this and swipe it over my skin. Clarisonic - Love this dude. Needs to be charged, though. Biore Pore Strips - My mom bought these for my brother and I over winter break and I got to keep the rest (woo!!). They get the job done, but for some reason don't stick to the sides of my nose very well. Let me know if you liked this kind of post in the comments below! Loved this post!!! I always love seeing what beauty products other people are using. 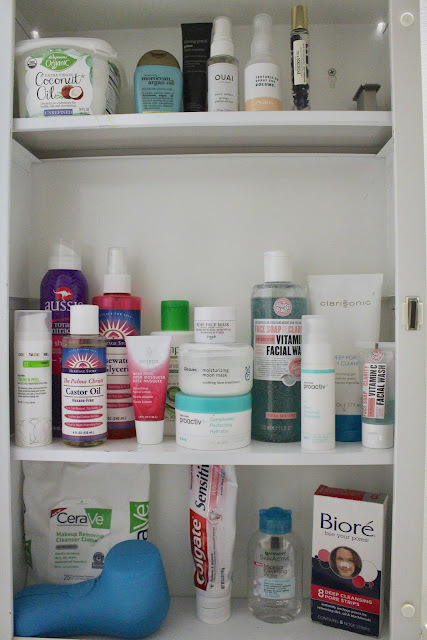 Spotted a few of my favorite products in here, as well as some new ones I want to try!